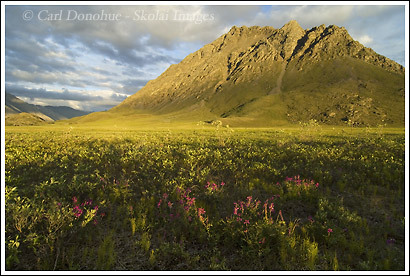 Here’s the second photo from this series on ANWR. This photo was taken in the middle of the night. It doesn’t get any darker than this in the arctic north during the summer months, unless there’s serious cloud cover. I had camped near the junction of the Marsh Fork and Canning River, just north of the Continental Divide in the Brooks Range, ANWR. After dinner I set out on a walk to look around and to maybe make a few photos. I hadn’t gone far when the mosquitoes starting driving me crazy. My hiking buddy said he’d “had enough” and returned to the safety of his tent. I trooped on, and ended up having a nice walk. The mosquito infestation seemed to level out, and I decided I could tolerate it for a little longer. I headed out across the broad river basin, and made my way towards this majestic peak. The sun started to brea through the few clouds that were kicking around, and I started seeing these little pink-ish flowers around (arctic lupine – Lupinus arcticus). This peak drew me to it, and I knew that would be my subject. Eventually, after some time scouting around and exploring the flats, I settled on this composition. What I wanted to portray here was a combination of things: the majesty of the Brooks Mountains, the vibrant spring flowers, the glowing arctic light, and the vast expansive nature of the range. ANWR has a magic all its own, and I hoped to make a few photos on this journey that might help portray some of that beauty, and help strengthen the arguments against opening the region to drilling for oil. This is one of my favorites, and certainly was one my favorite evenings (much more favorable that the evening it snowed while I slept in a cold, wet sleeping bag). The difficult part about this photo was working with the relatively strong backlight. I had the sun right over my shoulder, and everywhere I tried to shoot from, my body cast a shadow up the face of the photo. This composition helped me, because I was able to use the shadows from the longer grasses and shrubs nearby to help disguise my own. Finally, I ended up getting as low to the ground as I could, setting my camera on the tripod, and, after firing a few test shots, I decided I’d have to use the camera’s timer, and right after I clicked the shutter, simply dive to the side to get keep from having my shadow in the image. I think I went to the right. The camera timer was on 5 seconds, so I clicked it, dove off to the side, and waited for the shutter to trip. 5 seconds later, I had myself a photo. By now I was pretty covered in mosquitoes, and decided to hit the backside of my hike and start looping around for camp. By the time I got there, I was pretty much covered in mosquitoes. My buddy was sound asleep, sacked in his tent, nary a mosquito anywhere to be found for him! This entry was posted in Adventures, Alaska, ANWR, Backpacking and Hiking, Landscapes on May 7, 2007 by Carl D.
Carl, what a fascinating photo journal you have here. It’s great being able to read details about a photo shoot without leaving home. You didn’t mention the temperature; was it cold there? In answer to your question, the temperature was all over the place. One afternoon we had specks of snow falling. Other days we hiked in shorts, and swam in the cold arctic waters. In general, it tended to be pretty dry climate, warm in the days (if it was sunny – if the clouds rolled in the temperature would drop retty quickly), and cool at night – maybe 45degF. We actually got super lucky with the weather on this trip .. it was easily the best weather I had all that summer in Alaska. Thanks for the kind words about the photo. I’ll try to dig up a few more. Oh, and thanks to Mike ..he’s an awesome photographer hmself!